An artichoke dip baked in a loaf of bread until ooey gooey and cheesy and good! With the big game day approaching I have been thinking about snacks more. Last weekend I got the chance to try making an artichoke bread that has been on my mind for a while. The artichoke bread is essentially an artichoke dip that is baked on bread until the crust of the bread perfectly light and crispy, the dip is nice and warm, the cheesy topping is melted and golden brown. For the artichoke topping I decided to start with my favorite hot spinach and artichoke dip and I removed the spinach and tweaked it a bit. (You could of course leave the spinach in for a slightly healthier version.) For the bread I used a loaf of Italian style bread that I cut it in half lengthwise and then scooped out a bit of the center to provide room for more filling. The next challenge was baking the bread for long enough to heat up the artichoke dip so that all of the cheese in it melted without the crust of the bread burning. I decided that the best way to go about it was to cover the bread in foil while it warmed up and then to remove the foil near the end to let the cheese on top melt and turn golden brown. The artichoke bread turned out amazingly well! I used a nice fresh loaf of Italian bread so while the crust was light and crispy the inside was nice and soft and moist. The warm artichoke dip with the melted cheesy topping was so good and the fact the it was in the perfectly cooked bread made it even better! Mix the artichoke hearts, green onions, garlic, cream cheese, mayonnaise, sour cream, mozzarella and parmigiano reggiano reserving some of the cheese. Hollow 1/2 an inch out of the center of both halves of the bread. Spread the mixture into the hole in the bread slices and top with the reserved cheese. Bake in a preheated 350F/180C oven covered in foil for 20 minutes. Remove the foil and continue to bake until the cheese is melted and golden brown. Wow. I love artichokes. And bread. This looks delicious and I can't wait to make it. Thank you. This bread looks amazing Kevin! I love you, my scale hates you. Count me in for some artichoke bread! Sounds amazing and looks great! I'm not crazy about artichokes, but the rest of those ingredients sounds good to me! YUM!! I absolutely love this idea! Artichoke dip is one of my favorite hor dourves at parties. This is a great way to grab it and put it on your plate and eat standing up. This is one of the most beautiful looking dishes I've ever seen! Just chatted about spinach artichoke dip, and now you have this! Love it! Oh lordy this looks magnificent! Artichoke dip is one of my favorite things ever so I'm sure this would be just as terrific. Shut up! This bread looks totally off the hook!!! This is pretty darn close to my brother's artichoke bruschetta – and looks amazingly yummy! Artichoke dip is one of my favorite things. You can't go wrong with it in bread form! Dear Lord, Kevin! I want to jump through the screen for a bite!! That looks like a meal in itself! Great adaptation for artichoke dip! Now THIS I have to try! it looks amazing! So creative! Looking forward to trying this one! What a fantastic and different idea for an appetizer. I am totally making this. I am with the gal and the scale though. kevin I made this and served it with spicy hummus. so good. You rock, dude. I am definitely making this today, I have everything needed. I might sub Boursin for the cream cheese or would that just be overkill? Oh my..this is a fantastic idea, artichokes+cheese+bread. These bread sticks look mouthwatering! sounds wonderful with artichokes and cheese together! This looks just wonderful! I'll have to try this soon! You are so good with snacks – I'd love to be a guest in your house! Looks delicious. Also made this deliciousness for the football game yesterday and I cheated a little. Fairway, our local grocery store, makes a killer artichoke dip so I just jazzed up the pre-made one with a little extra pecorino, parmigiano and pepper. I was worried about the cheese sticking to the foil so for the first 20 mins I tented the bread in foil then removed it, added some sharp cheddar and mozz and let it get bubbly and brown. Another winner! Amazing! I love your taste in food. I think we may be soulmates, in the palette sense that is. Now, if only I can figure out how to make this as delicious and still make it low/cal and low/fat, I'll be all set! This looks right up my alley- I would LOVE this!! This seems too good to pass up. WOW! Oh goodness, this looks great! Wish I could just pull it off the screen and eat it. I'm printing this one and will be making it this weekend. Thanks!! Oh my! 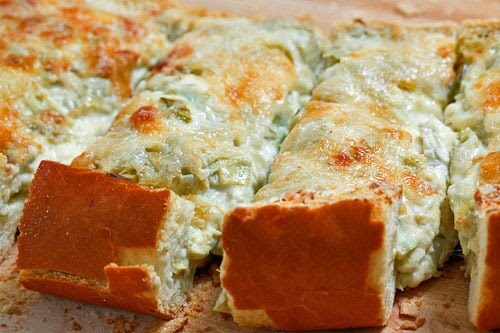 I never would have thought about doing artichoke bread, but this looks amazing! I can't wait to try it out the next time I have a dinner party! Thanks for the awesome idea, yum!!! your blog is just heavenly. I will so..be…making…this bread! Yum! This was a HUGE hit at my Superbowl party, thanks, it will become a regular party offering. saw this in the sidebar.. delicious! and it doesn't have an intimidating ingredient list, so that's a plus. Bookmarking! This is on my "to make" list this weekend. It looks so yummy can't wait to try it out. OMG this looks incredible, I fear that I would eat way more than I should! I am going to give this a try the next time there's a crowd around! I made this over the weekend, and it was fantastic! It will definitely become a part of our regular rotation! It was so good that I shared it with my readers today (giving you full credit, of course). Thanks so much for the recipe. Can't wait to look around your site to see what I'm going to make next. This looks AMAZING. Garlic bread-artichoke dip hybrid! Love artichokes AND cheese,the perfect combination, can't imagiine anything better, anxious to give this a try!!! It was a good idea, but it just didn't work for me. Maybe it was too cheesy (is that even possible?) The picture was awesome, though! sooo yummy!!! May try it with lump crab or peppered bacon next time. It was Winner!! Thanks! Pinning this right now and running to the store to pick up ingredients too! That's so original and so simple too! Oh my, are you kidding me?! Looks so good. I'm making this for breakfast tomorrow! I loved this idea and posted it on my FB, I made it for Superbowl Sunday food table and it was a hit! I make this recipe with the Knore pkg and included the pkg of spinach. I cooked it in a casserole and then filled the bread added the extra cheese on top and broiled it…everybody loved it . Easier to manage as your filling a plate at a potluck…thanks again for the post!P.S. How do do get a 10 month old to eat spinach , fight our grand-daughter for a piece of this bread, yum! I made this with dinner tonight after finding it on Pinterest…it was amazing and the family loved it! Thanks for sharing..I will make this again for sure.. I LOVED this bread!! My only mistake was that I put the halves back together when I went to cut it. I love your site + all these yummy comfort foods I want to indulge in! This artichoke bread is no different, I just had lunch but wouldn't say no to this if it were in front of me right now! I added chunks of chicken breast to the artichoke mixture and it was absolutely wonderful…great for a meal! I've made a similar recipe like this, and you can freeze it to have on hand when you need a quick appetizer, or need to bring something to a party. Just make this mixture, spread on the bread, close the halved and wrap tightly in foil.. When it's time to eat them, just put directly in the oven for a little longer! I keep them stocked up! Melted cheese is wonderful but the combo with artichoke is genius! I've only tasted artichoke bread once and if this recipe is what I've been searching for, I am deeply indebted to you for sharing it! I tried this last night but I added some diced green chilies and jalapeños. It was delicious! This artichoke bread looks awesome. I love this idea. Artichokes & cheese is the perfect combination. Thanks for sharing. Made this the other night and it was soo good!! Will be making again, possibly as a dip next time. Looks and sounds great! I'm going to try this tonight! I love these type of recipes! It' seriously my comfort food. I made your artichoke bread for our Thanksgiving appetizer & it was absolutely delicious! My son said it was one of the best appetizers I have ever made! I cannot imagine creating & preparing recipes in a closet-sized kitchen, but it is obviously working very well for you! Please keep creating more wonderfully delicious recipes for us. I've been making something very similar to this for years….here's a little tip. I take the bread that was taken out, sautéed it in a little butter until its crispy and lightly browned, let it cool and add it to all of the other ingredients that make the filling. It's acts like a binder to hold it all together and there is no waste! It also adds another level of texture…I love the added crunch! I've been making a very similar recipe for years. Here's a little tip…that bread that you have left when you hollow out the loaves….tear it into little pieces, sautéed it in a bit of butter until its crispy and lightly browned and add it into all of your ingredients that make the filling. (make sure you let it cool first). Not only does it act like a binder, it adds another level of texture….great crunch…and there is no waste! Peggy Tisone: I like the crispy bread bits idea! Thanks for sharing! Making these for the fourth time tonight. We host UFC parties and this dish is highly requested and runs out quick. Thank you!!! This looks so amazing! I have a spinach dip recipe I always make, and every time it's a HIT at parties…I'm totally going to put it in a loaf of bread! genius!! Thank you for sharing this! Can someone elaborate on the 'hollowing out' part? Are you cutting into the side of the loaf? Are you cutting the loaf in half first? I'm having trouble picturing how I am going to do this. Kimberly: After cutting the loaf in half you are removing some of the soft inside of the bread to make room for more dip on the inside. i did in fact make this. i also put the excess bread around the rim, while i baked it, so to not waste it. it was great and my family really enjoyed it. i do think i will add some diced green chillies to it next time for a lil something extra. cheyenne: Glad you enjoyed it! You cannot go wrong adding some heat in the form of diced green chilies to this! when I do my shopping. This recipe looks so good but there's one small problem; I'm allergic to mayonnaise (mainly the egg in it) is there a suggestion you have that i could do to either substitute or replace the mayonnaise? This formula for Artichoke Bread is beyond good! Have made it multiple times and with this reminder will be making it again very soon. Thank you Kevin. I I have made this as written 5 times over the past year and a half. It is fantastic! I always get requests for it and for the recipe. You cannot go wrong with this. It is rich, decadent and sinful. I usually go with sour cream in place of the mayo and mashed avocado, yogurt and ricotta would all work! Enjoy!